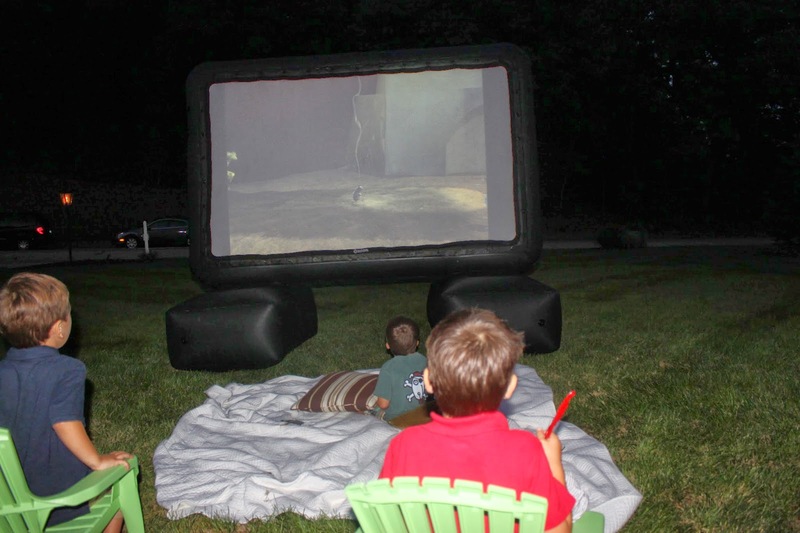 We already had a projector which is partly why I wanted to do this. 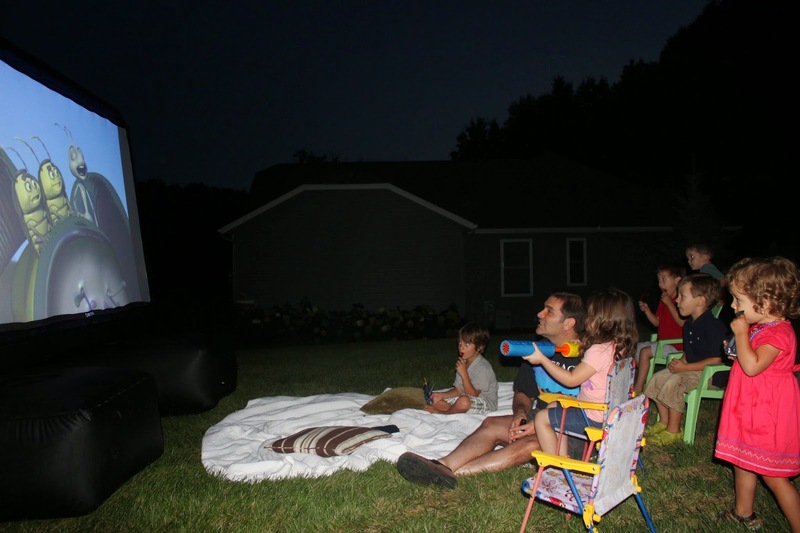 Although you can rent them if needed, just check with your local rental company or friends. We hooked up the projector to our laptop and used quality desk top speakers which played the movie loud enough for everyone to hear. For the screen, I found DIY instructions on how to make the base out of PVC pipe (which is very cheap) and a white sheet for the screen. The step by step instructions I found on Pinterest didn't seem too complicated, but it was something that would take time, and with a husband who was commuting out of state for work and myself on the verge of bed rest I decided to spend a little more money but save a lot of effort and simply rent the screen from a rental company. It wasn't that expensive and very easy to set up and take down. In place of the home cooked pastichio (Greek lasagna) and keftdedes (Greek meatballs) we went with easy, kid friendly carry out pizza. Although, I did add a Greek salad, antipasto platter, fruit salad, and my mother in law's pita (cooked dough stuffed with feta cheese and glazed with butter). Our friends added home made tzatziki sauce with pita bread and a variety of delicious desserts. And yes, you can never have too much food at a Greek gathering! 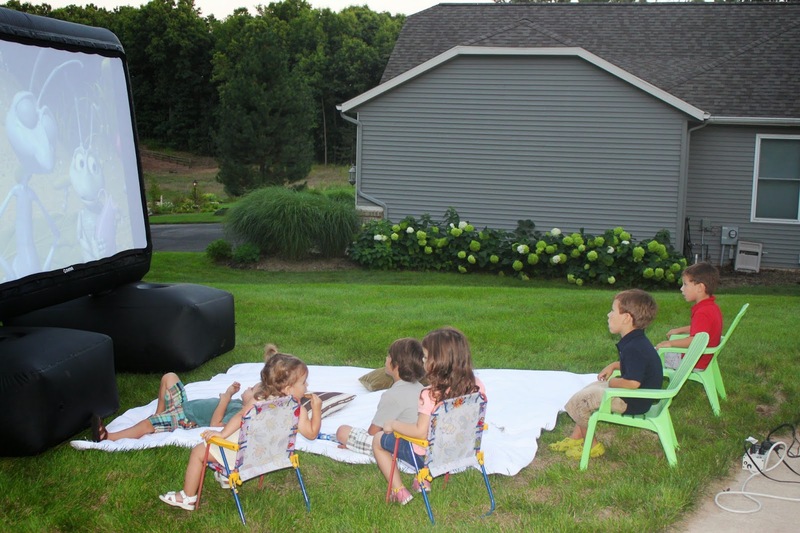 We had the movie screen set up in our front yard, so I set up the dinner tables nearby in the driveway. I added a festive red table cloth, brightly colored pin wheels for decoration, lots of tea lights, and hurricane glasses filled with sand, sea shells, and candles. Unfortunately I did not get any pictures of the table or the whole party at night. 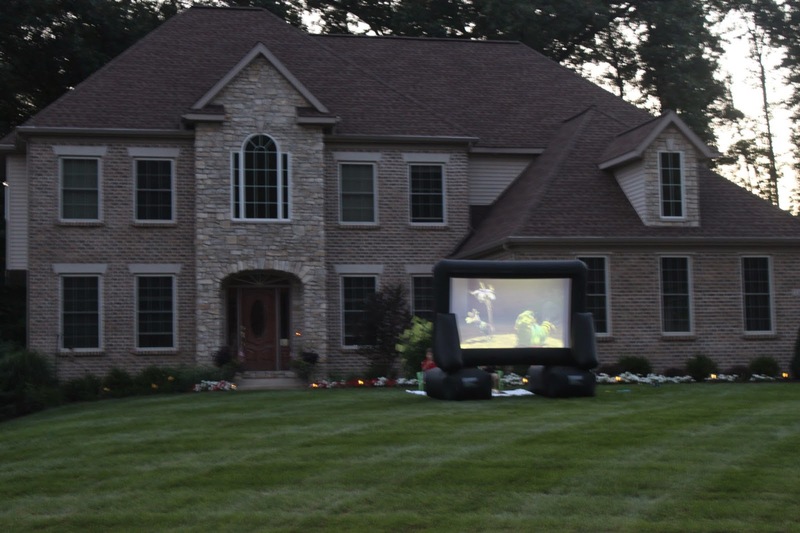 My mom drove up at the end of the night and said it looked amazing from the street with the candles glowing and movie playing. Our friends arrived at dinner time so the kids could eat and play before the movie began. One thing I quickly realized is that it needs to be dark for the movie to show up well. We started the movie before sunset because we had young kids in attendance but it was hard to see on the screen. 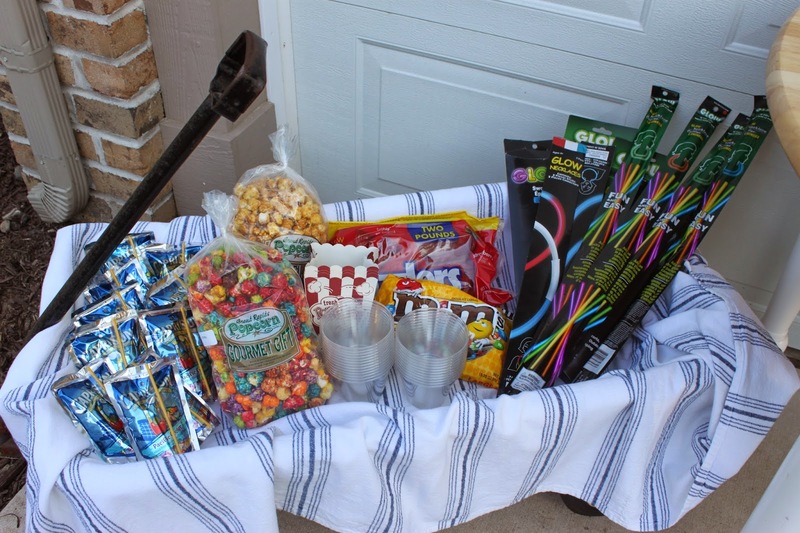 Although once we handed out popcorn and candy it didn't seem to be an issue! My guys have since requested that we do this again MANY times! 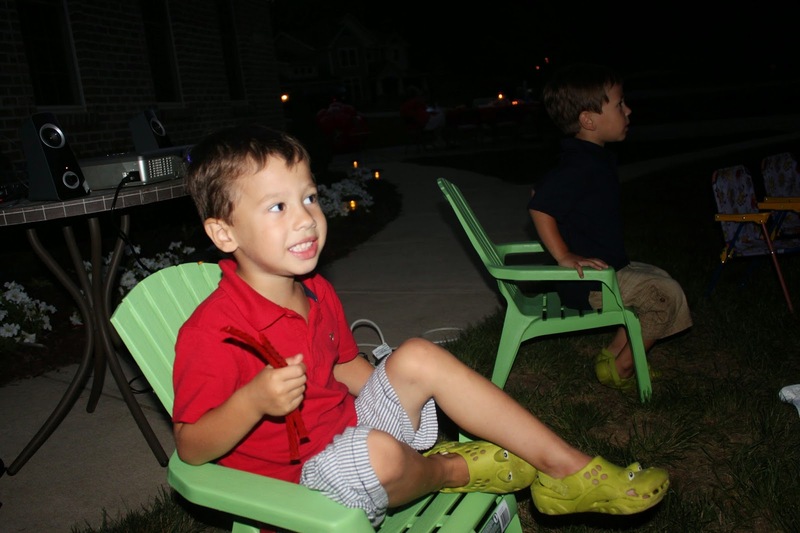 It was a fun filled night relaxing outside under the stars for the kids and adults! 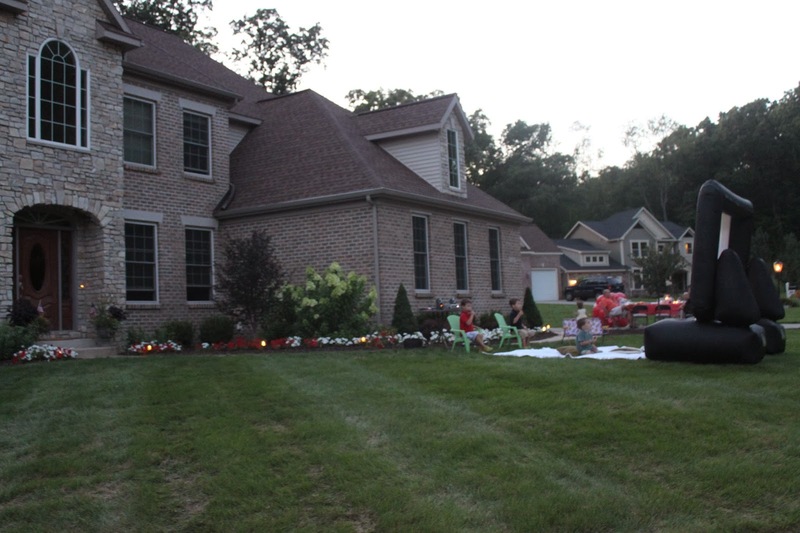 The adults got to relax and talk while the kids could watch a movie and run around in the yard. 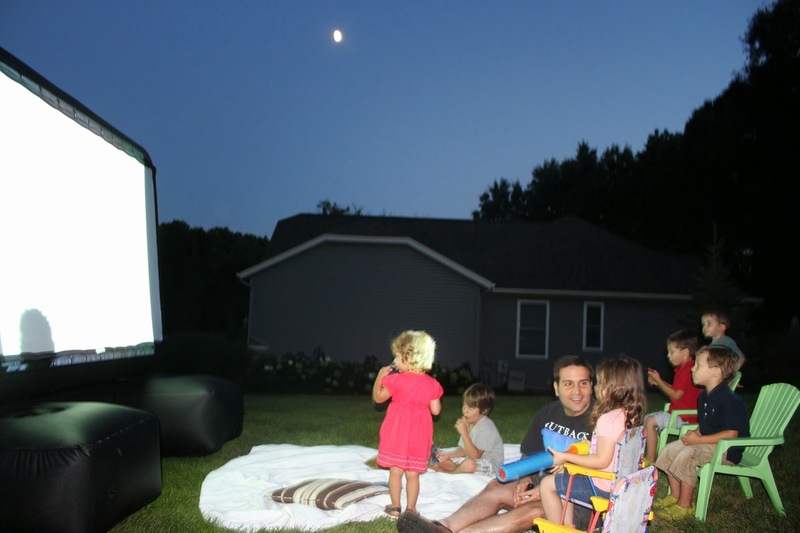 I will definitely be looking into the DIY screen this summer and planning on a neighborhood movie night in our new backyard! To see more of my party ideas, home decorating, favorite recipes, twin activities x 2, and all things "Mrs.Party Planner" please check me out on facebook and "like" the page. New blog posts will appear in your news feed.